Spring is a time to ponder what to do with that garden you’ve been thinking about all winter. While it might seem as if saving energy is something you can only do inside your home, savvy gardeners know that energy efficient garden design can help them enjoy the fruits of their labor and energy savings at the same time. Knowing the best places to plant trees for shade landscaping, for instance, can help keep your home cooler in the warmer months, and warmer in the cooler months. Energy.gov offers additional suggestions on how to take advantage of shade and wind shields to best protect your home and maximize energy use inside for each climate region. 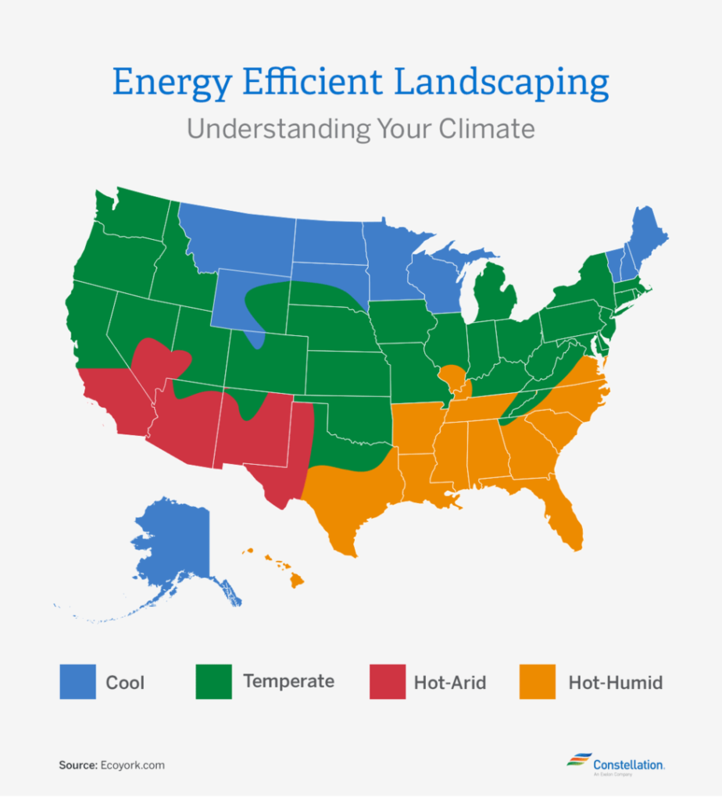 One of the first things you need to understand to create an energy efficient garden is your climate— more specifically, your microclimate. The United States has roughly four climate regions: temperate, hot-arid, hot-humid and cool. The microclimate, or the climate immediately surrounding your home, is particularly important for the optimal energy efficient garden design. Your home’s microclimate might receive more sun, shade, wind, rain, snow, moisture, and/or dryness than average local conditions. You might live in a cool region, but if your home is on a sunny southern slope, it could have a warmer microclimate than what is typical in your area. A home with a lot of well-placed shade trees, meanwhile, might have a cooler microclimate even though it’s in a hot-humid region. Nearby bodies of water could increase your area’s humidity or decrease its air temperature as well. Microclimatic factors also help determine what plants may or may not grow in your particular landscape. 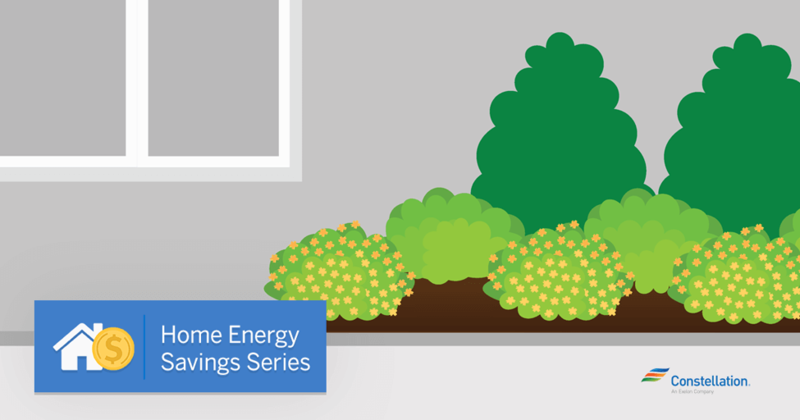 Here are some other spring landscaping tips for how to save energy gardening in your yard. One of the easiest ways to ensure you have an energy efficient garden is to make sure to use drought-resistant plants whenever possible. Not only does this ensure you don’t end up with droopy, dying plants if an actual drought occurs, but drought-resistant plants generally require less water than other plants. In other words, you will need less water to keep them happy. Which drought-resistant plants work best depends on your climate and microclimate. There are places to find plants that might work best for your energy efficient garden design — for instance, the Environmental Protection Agency has a website to help you find the best drought-resistant plants for your area. Simply find your state and click. Water during the coolest parts of the day so that the water lasts (i.e., does not evaporate) as long as possible. Group plants according to water needs so that the water you’re using is not wasted on plants that don’t need as much. Collect water in rain barrels. House Logic says that an inch of rainwater typically drops 500 gallons of water onto a 2,000-square foot roof. Why not capture some of that and use it to water your plants during a dry spell? A rain barrel can save about 1,300 gallons of water during peak summer months, House Logic says. That’s water you can use for plants — and if you pay for water from a public source, this would be “free” water that won’t cost you anything. Here are some ideas to brighten the look of your outdoor space. Arrange plants densely. Group your plants closer together and mix in taller plants. This helps create more shade on the soil surface and cuts back on wind movement through the plants, thus reducing evaporation and improving moisture retention. Mulching helps with water efficiency, too! Using the best mulch for landscaping is another critical part to creating the best energy efficient garden design. 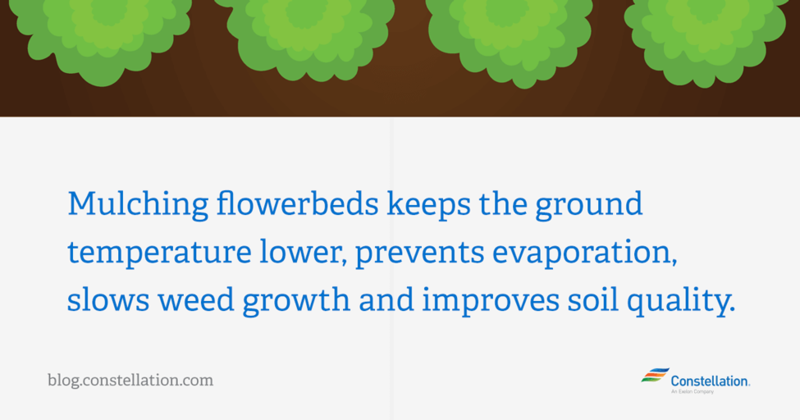 Mulching flowerbeds blocks the sun’s rays, which in turn keeps the ground temperature lower and prevents evaporation. Mulch also slows weed growth, improves soil quality and makes your gardens look more attractive. Use organic mulch wherever possible.This mulch will continue to decompose and add nutrients to the soil, thus improving the soil and likely plant growth. If water retention is important to you, the best mulch to hold water should be applied three to four inches deep. You might wish to visit your local garden shop or greenhouse to inquire about the best mulch to hold water based on your local climate. Garden professionals will likely have insights to share about what might be most effective in your specific case. Lawns are, in many ways, part of the American dream. You get a house; you (usually) have a lawn even if it’s miniscule. With that lawn comes certain neighborhood expectations. No one wants to be the neighbor everyone is talking about because their lawn is overgrown. That said, more homeowners are considering how to handle their particular yard. Some municipalities and government agencies have weighed in too. In 2015, for instance, the California Water Commission limited the amount of allowed lawn on new construction to 25 percent of the total lot. The Environmental Protection Agency estimates that about 30 percent of the 320 gallons of water a family uses as a daily average is devoted to outdoor use. About half of that outdoor use is watering lawns and gardens. Given that expense, it’s not surprising that homeowners are increasingly considering other options for traditional lawns, everything from gravel to artificial turf. Lawns make it easier to enjoy outdoor activities — croquet, bocce, badminton — and, if you have kids, it is a place to play that’s just a couple of steps outside the house. Can be a buffer between you and your neighbors. Curb appeal. Having a nice green lawn leading up to your home sets the house apart visually and, as any realtor will advise, curb appeal matters when you decide to sell. The Lawn Institute, a nonprofit devoted to promoting the benefits of lawns, notes that lawns can help combat soil erosion as well. Soil erosion, the institute says, costs the U.S. $6-$16 billion annually. A healthy lawn can reduce runoff to next to nothing as grass binds soil more effectively than any other plant. You have to mow lawns regularly. A lawn will likely require watering, which could be an additional energy expense. Assuming you’ve decided a lawn is a desired part of your landscaping design, you can still save time and energy by making some decisions regarding how often you mow your lawn. The kind of grass in your yard. Certain grasses grow more quickly than others. Whether you fertilize your lawn. Your grass will likely grow faster and need mowing if you use a high-nitrogen fertilizer. The time of year. Some grasses grow fastest in the cooler months of fall and spring, while others grow fastest during summer’s hottest months. How you water. If you cut back on watering, virtually all grasses slow their growth as a response. More water likely means more mowing. The height you cut the grass. Raising the blade height of your mower can shade roots, which reduces browning and weed growth, as well as the frequency with which you need to mow. Higher grass can also reduce a lawn’s water needs. Some homeowners decide to make the size of their lawn smaller, or just toss in a bunch of wildflower seeds and let Mother Nature take charge if they feel like they’re needing to mow too frequently. There you have it — all the tips you need to have an energy efficient garden. Now, start (green) thumbing through the gardening catalogues and get ready to plant! Water savings of up to 50% can be achieved by adopting organic principals for lawns and beds. Refer to these two newsletters for specific recommendations. Hi, Steve! Thank you for sharing your thoughts. It’s definitely important to be conscious of saving water, and every little bit counts. Thanks for taking the time to comment!